Hello XS , i need some help with my Hydro-Farm ActiveAqua 1HP water chiller - https://hydrofarm.com/p/AACH100 . I bough this unit cheap and barely used here where i live and it was a very good deal cheap for a 1HP water chiller. I did mod the controller to let the compressor run and never stops , always On so that i can bypass the max 32f or -0c restriction of the controller. So far so good in the first few months it was running perfect at maximum -21c using Car antifreeze Glycol /H20 50/50 mix , everything is well insulated and i use a very strong pump PANWORLD 100PX PUMP 790 GPH. This is not my first water chiller and i was let down by the loss of performance after 6-8 months of use , it is also the first time i have encounter this problem :/ . The water chiller right now won't go down all the way to -21c like a few months ago , it has lost performance and now it is going down to only -5c , wish is nothing for today's hardware as i need it at least -20c to hold the temps when loading Intel's 9900k / AMD 2700x on benchies. The problem started around a month ago after running the water chiller for 12 hours non stop using a Ryzen 2700x at 4.8Ghz and a RX570 GPU moded and overvolted ( heat monster under load lol ) on 2 separate loops off my moded igloo external reservoir using only one water chiller for both heat monsters. After that day I noticed my cpu crashing under load and it was hitting very high positive temperatures the next subsero session i did. I kept waiting for the water chiller to reach -21c that day ( 6 hours ) and never happened , it was hitting maximum -5c . Since then i have troubleshoot the water chiller with no good outcome and i have not been able to make it run at -21c again. I flushed the reservoir on the water chiller , cleaned everything and re-did all the insulation , cleaned the water blocks and the water pump , change and use new tubing on it , use new mix of glycol and H2O 50/50 same formula as before , cleaned the whole chiller and nothing that i have done has work in order to make it run as colder as before at -21c iddle. The only thing i can think of is a R401a gas leak or maybe i damaged the compressor i really don't know but if anyone can give me any advice or help to get my water chiller running back to very low temps -21c again it will be really appreciate it. Last edited by chispy; 12-06-2018 at 04:17 PM. Any pressure gauges on this ? Maybe it has a leak and leaked out all of its gas ? Sadly no it does not :/ . I will probably take it to my friend shop for inspection but is a pita as it is very heavy , most likely it is leak but i'm not 100% sure. Will update if i find out what's wrong with it. Thanks for posting back my friend. You could ask your friend for a piercing service valve (like this) https://www.grainger.com/product/SUP...ng-Valve-6X898 and check the pressure at the service port with a standard manifold set, but it sounds like the unit is going to need a service anyway as the sustained load and high pressure may have cracked something. Thank you for the response and the help. Most definitely i will need to take it to the shop for service and check up after all the holidays are over. I will give it one last run today to see where it is right now temp. wise just to see if it has degraded even more. Hi Angelo, normally I would say not to run a unit if it is malfunctioning, as if there is a leak on the suction side then you will be pulling air into the system. As you have already run the unit for some time in this condition, any damage has already been done. If you are very lucky, it may just be that an over-pressure relief valve has released some gas, and the unit will just need re charging. If the unit is no longer sealed then it will require new oil and a replacement filter/drier in addition to the necessary repairs. When you take the chiller in for repair, try to explain the heat load you are using it with (600w+) and that you are running the compressor constantly for up to 12hrs (the controller would cycle the compressor so it would never run so hot). They may be able to tune the unit for a higher load and cooler operating temperatures which would be more reliable for you. Thank you so much for the help. I talked to my friends at the shop but they cannot work and or check my unit after new years due to them having a lot of work and the holidays are upon us. I will tell them exactly what you wrote here to see if we can tune it for higher loads and charge for cooler operating temps. It would "work" yet perform poorly if it failed. Thank you for trying to help Charles. The condenser fan is working. Finally my friends at the shop fixed my Chiller. It had a leak , the leak was fixed and regas + tune = the same temps as before -21c , happy Angelo . 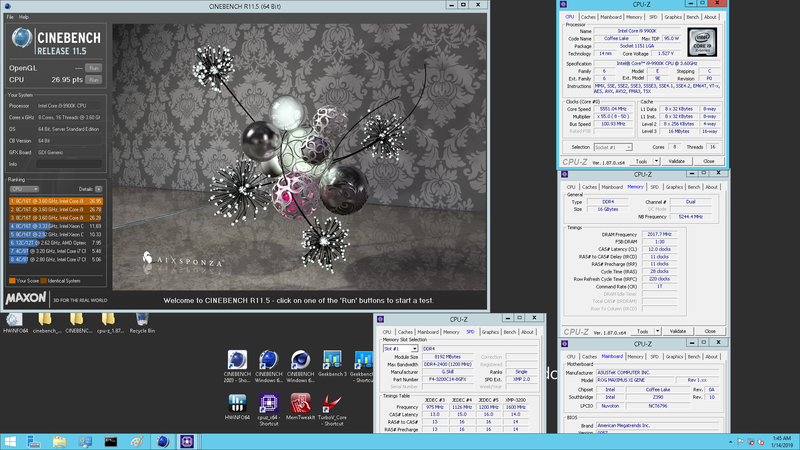 It holds my 9900k @ 5550Mhz+ 1.53v on Cinebenchs heavy cpu benchies and 3D. Good to hear Chispy ! !